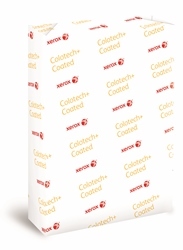 Xerox Colotech+ Silk Coated SRA3 paper delivers guaranteed performance on digital colour copiers and printers. This double side coated paper has a lower sheen level which enhances text without compromising on image impact. The coated surface gives near offset print quality from your digital colour printer. FSC Certified. For producing beautiful images and crisp text.